Born an Army brat, Erik Odom has been personal training clients for four years. Odom is certified through the American College of Sports Medicine (ACSM). He also holds a Bachelor of Science in human nutrition, foods and exercise from Virginia Tech. Dried fruit is widely viewed as a healthy snack. While it is a better alternative to sugary candy and other junk food, dried fruit should still be consumed in moderation because it contains much higher amounts of sugar and calories than regular fruit. In addition, removing the water from fruit makes it much less filling, so it is easier to overeat. Tropical dried fruit like pineapple and mango are especially of concern because tropical fruit typically contains more sugar than other types of fruit like apples and berries. When eating dried fruit, measure out a serving size and avoid eating directly from the bag, which increases the risk of overeating. Compared to regular mango, dried mango is much more concentrated in calories and carbohydrates. One-third cup of dried mango contains 160 calories. Most of the calories in dried mango come from carbohydrates, because dried mango contains only small amounts of protein or fat. One-third of a cup of dried mango contains 40 grams of carbohydrates, 2 grams from dietary fiber and 32 grams from sugar. 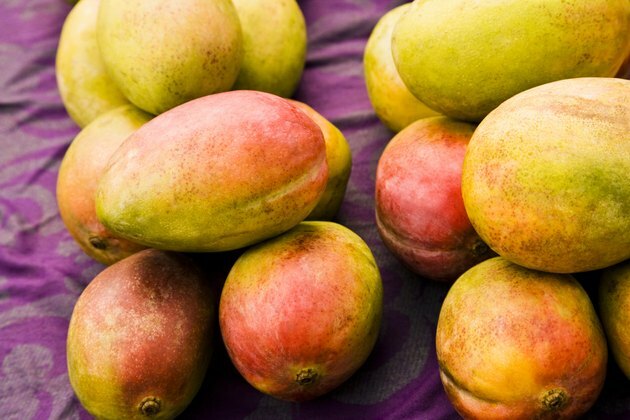 The sugar in mango fuels your day-to-day functioning and serves as a preferred source of energy for your brain, while its fiber content supports your digestive tract. Avoid brands that coat the mango in additional sugar, which adds even more calories. If you are a diabetic or have trouble controlling your blood sugar, dried mango is not a healthy choice because of the high sugar content. Dried mango is a good source of Vitamin A--20 percent of daily value--which plays a key role in cell growth, healthy vision and a robust immune system. Unlike regular mango, dried mango does not contain high amounts of Vitamin C--only 2 percent of daily value). High amounts of water-soluble vitamins like Vitamin C are lost during the drying process. Although not extremely high in minerals, dried mango contains small amounts of iron--2 percent of daily value--and calcium--4 percent. Iron is important for oxygen transport in the blood and oxygen storage in muscle tissue, while calcium helps maintain bone strength and density and keeps your heart, muscles and nerves functional. Many brands of dried fruit contain sulfur dioxide, which is used to help dried fruit maintain a bright color and prevent rotting. Some individuals are sensitive to sulfites like sulfur dioxide and may have asthmatic reactions following ingestion. The Institute of Food and Agricultural Services suggests sulfite sensitive individuals avoid processed foods that contain sulfites, included dried fruits. Instead, opt for organic dried fruit that doesn’t contain sulfites. Will Dried Fruit Cause Weight Gain?